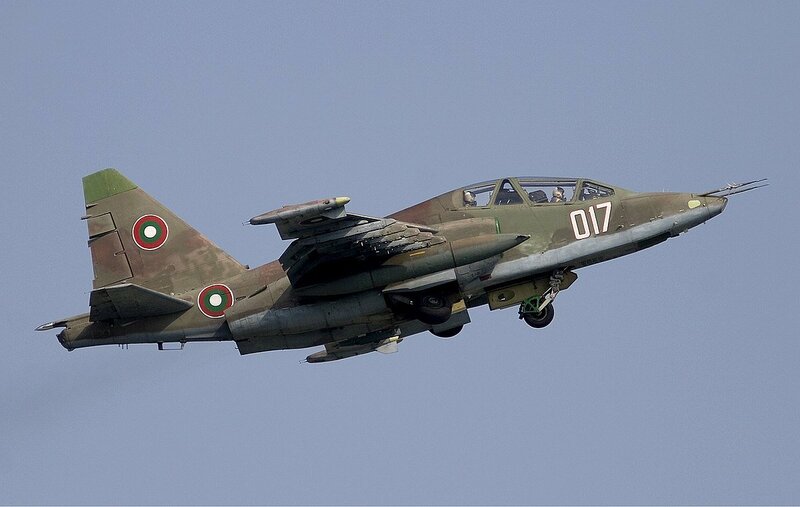 Bulgaria is about to Conclude the Deal for the Su-25 Overhaul with the Belarus' "558 ARP"
SOFIA, Bulgaria, (BulgarianMilitary.com) – The Bulgarian Ministry of Defence is about to conclude the deal for the repair of the Bulgarian Su-25 aircraft with the only bidder – the Belarusian 558 Aircraft Repair Plant. This is revealed in a new decision signed last Friday, by the Bulgarian Defence Minister, with which he approves the deal, since, in the beginning of November, he in the capacity of a contracting authority, in accordance with Art. 22, para. 8 of the Public Procurement Act, instructed the appointed committee to renegotiate with the Belarusian company, and to confirm the agreed price reduction with a new report, learned BulgarianMilitary.com. The contract will now be explicitly stipulated that the total cost for the capital-restoration activities of the deal may not exceed BGN 49.2 million (with VAT) or BGN 98.4 (with VAT) after the approval of the Bulgarian Parliament, and it should apply both for repair in Su-25s entirety as well as partially. But still, because of the price discrepancy, it is not clear how many of them will be repaired. The latest report of the committee, which led the negotiations, says that the total cost of carrying out all possible activities, set in the procurement documentation (if there is such a need) for 14 Su-25 aircraft amounts, to € 73,665,500 (excluding VAT), which means that the Bulgarian MoD will be able to overhaul a maximum of 8 Su-25s if the government approves. In his current decision, Karakachanov explicitly states that maximum amount of BGN 49.2 million (with VAT may) under the framework agreement may not be reached and the agreement may be terminated at the request of the contracting authority. The Su-25 overhaul must be completed in the period of 4 years. The tender has lead to a serious scandal after the only company which has submitted documents offered about BGN 310 million for the Su-25s overhaul, three times higher than, the set in the documents, estimated price of up to BGN 49.2 million (VAT included). However, then, the Bulgarian Ministry of Defence, stated that this was not a ground for disqualification of the Belarusian 558 Aircraft Repair Plant, which provoked the opposition Bulgarian Socialist Party, BSP, to claim that the deal is already set. Another dispute related to the Su-25 overhaul derives from the fact that the Bulgarian state-owned company Avionas claims to have the resource to fulfill the deal or at least part of it, but the Bulgarian Defence Ministry has a different opinion. The deal is set to be concluded with the signing of a framework agreement as well as with further specific repair contracts depending on the needs and financial capabilities of the MoD. On Monday, the Bulgarian Ministry of Defence also published information related to the New Patrol Boats Project for the Bulgarian Navy, which lists the names of the companies to which a request for proposal (RFP) has been sent, which are „NAVAL GROUP“, „Fr.Lurssen Werft GmbH & Co.KG“, „DAMEN“, “MTG Dolphin”, „Fincantieri“, „Navantia“ и „ThyssenKrupp“.